You know that saying - the cobblers children have no shoes? I'm the quilter who has no quilts. I give them all away or work on others' quilts. Until now. I finally made a quilt for my own bed. A king sized quilt. I wanted something neutral, simple and calm. I chose a variety of neutral fabrics in taupes, and greys. I chose someone else's pattern this time - from Carolina Patchworks - Sweet Garden (Emily Cier) . I am not a happy pattern follower, and was grumbling a lot, but this pattern just seemed to suit what I wanted to do - and why reinvent the wheel? But of course I had to add new treads to the wheel. LOL I initially set out to adjust the pattern to be entirely a king. Pieced it all together, laid it out on my bed and my heart sank - it was just too busy. Too quilty. Too much patchwork for the mood I wanted in my room. So I *GASP* hacked it up so it was a smaller bit of patchwork and added some calm, white fabric to the top and bottom. And then I quilted it - and got a little carried away. started to add swirls - I just marked the 'c' shape of where I wanted the big swirl placements. Then I started to fill in the shapes with fillers to show movement and flow. For the patchwork, I just did simple ribbon candy in the sashing. This gave the texture and allowed the squares to pop like little pillows. For the squares or rectangles larger than 4'' I quilted a line or two in the space to keep the batting and fabric stable. This is where I feel like a rule breaker. 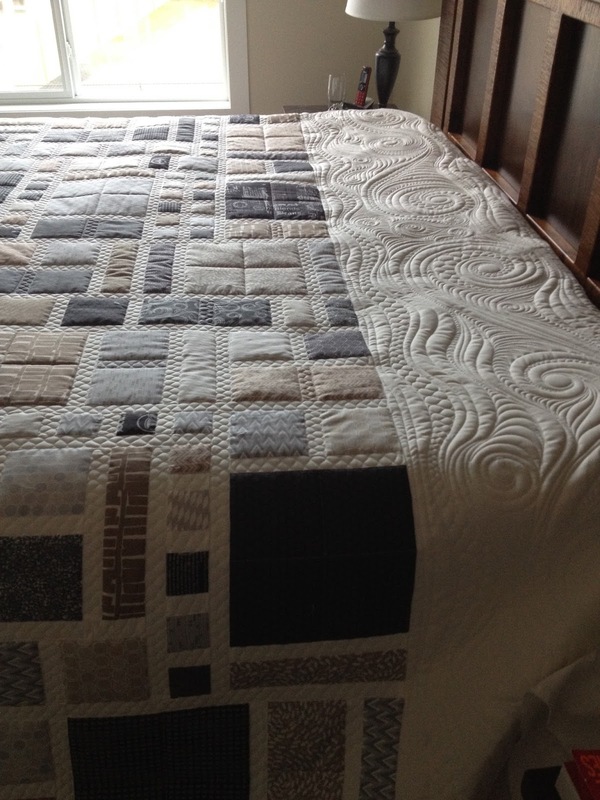 I know it should be consistent amount of quilting throughout. This is where I rebel and feel like I can't follow along. I WANT this added interest. 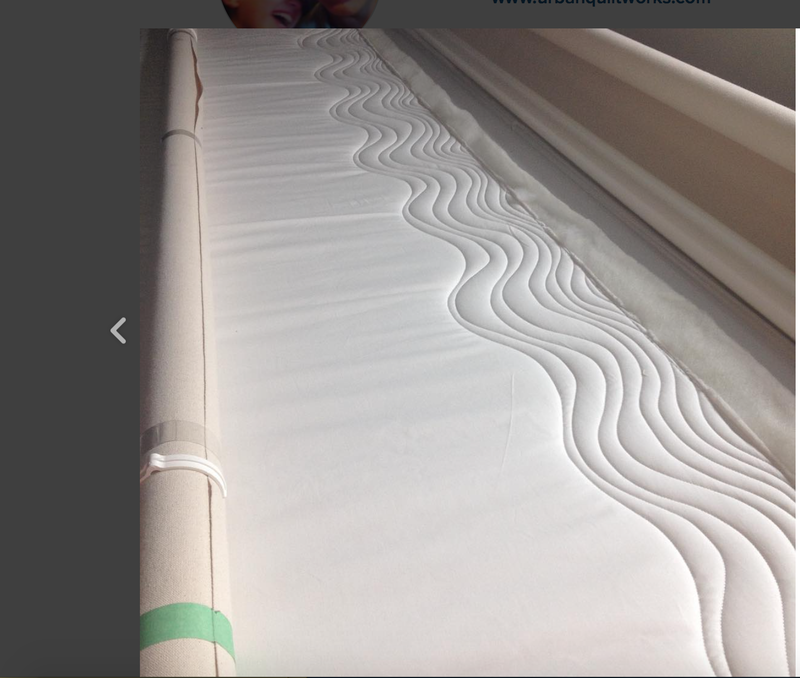 I mean, look at how the little pillows pop! This is my bed anyways....I will report and edit this post in the future if I find out it is a useless experiment. But I don't care. I love this look. 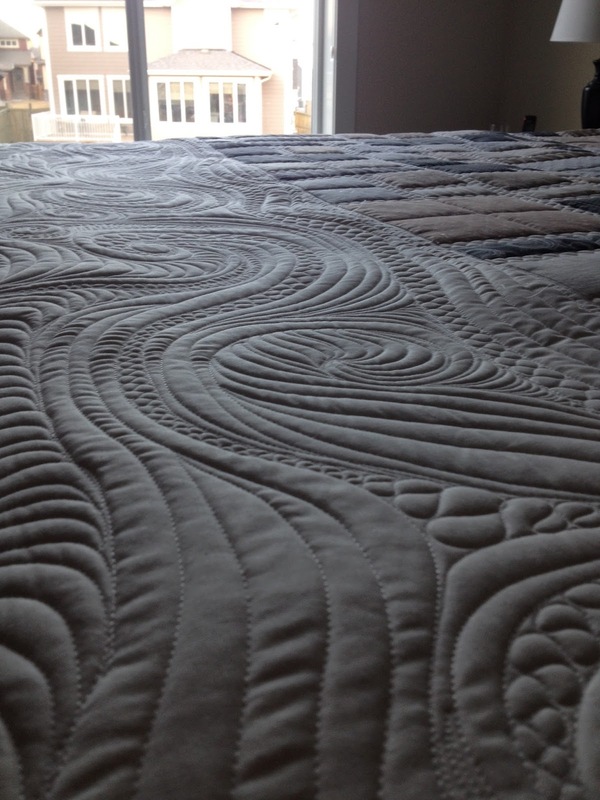 This was very free flowing quilting - all improvisation with me just knowing that I wanted it to look swirly, flowing and show moment - an ode to the beach, waters, etc. My quilt has yet to be bound. It is still 'commando' without a binding. I will keep it plain white to keep the focus on the quilting and the colour palette. I hope you like it! It's pretty breath taking on my bed. Now I'm too scared to use it. I am so super thrilled with how it turned out. Battings - Hobbs heirloom 100% wool batting. That's really lovely. I also like the pouf of the coloured fabrics. Enjoy using it! I love your free flowing quilting on this one as well as the choice to not quilt the blocks, they really pop! Magic!!! Enjoy the fabulousness of it! 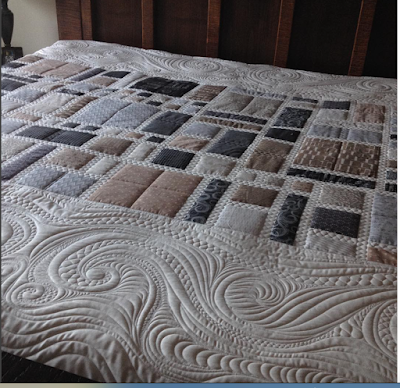 It is a gorgeous quilt, Andrea! 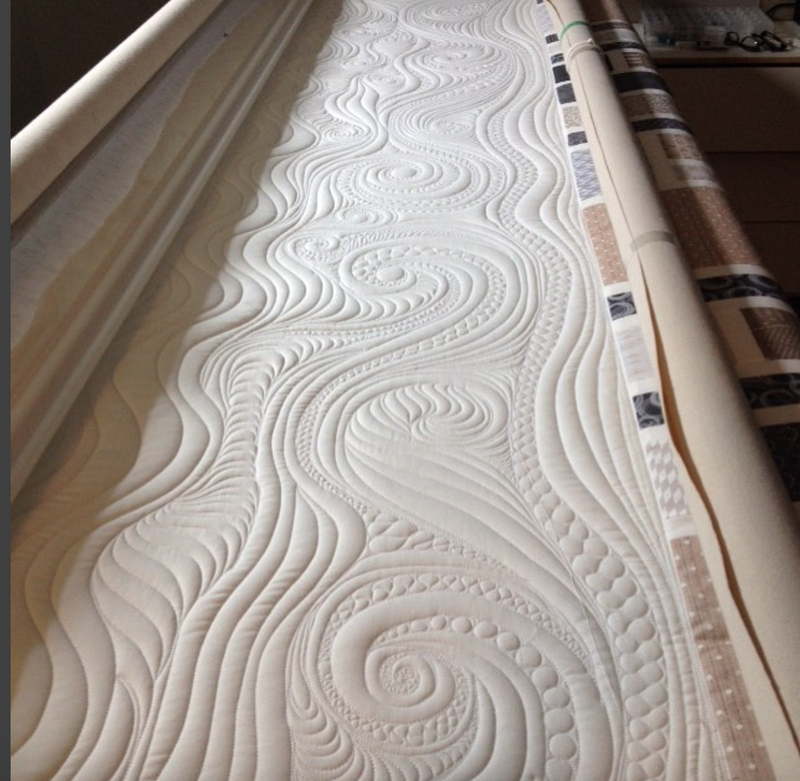 Beautiful quilting as always. Love it!! Did you ditch the squares, or just the sashing stitching? Gasp! It is absolutely gorgeous. Love the swirling quilting, it adds so much movement to your quilt. WOW, you are amazing Andrea. 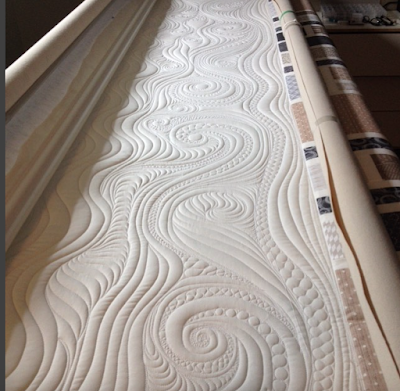 What a beautiful calming quilt for your bed. 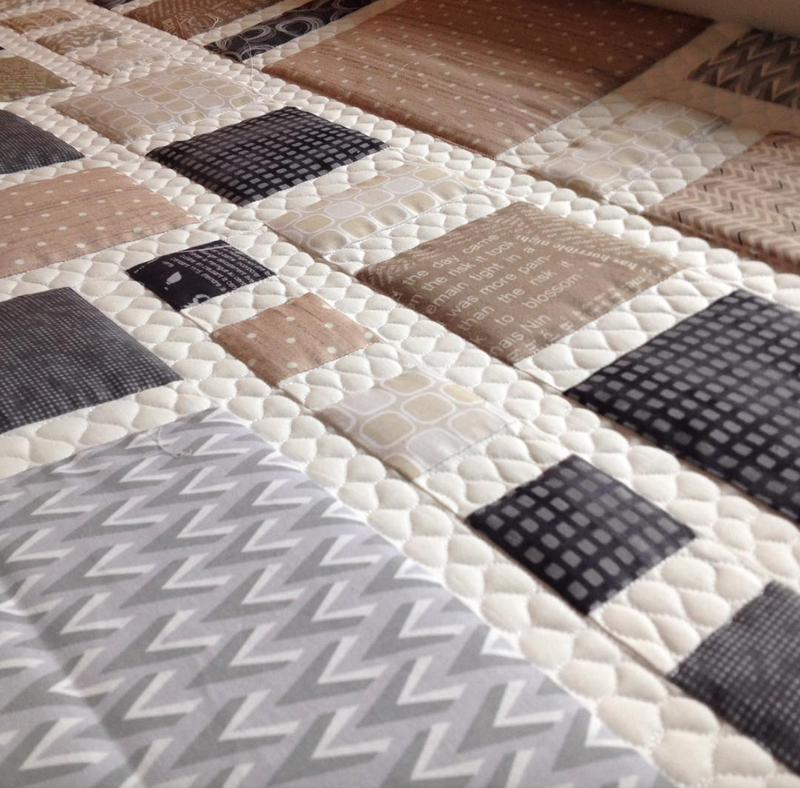 Love all the stitching on the white fabric, and I agree, love the pillow effect on the squares. Absolutely beautiful. OMG, OMG, OMG!!! This is incredible! I am mesmerized by the lovely texture you have created here. It looks luscious, almost like you've dipped your finger into some whipped cream and just doodled this out. Honestly, this is one of the most beautiful quilting jobs I've ever seen. 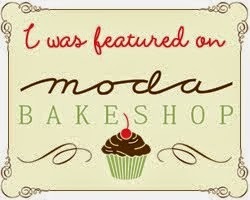 Thank you so much for posting these drool-worthy photos! 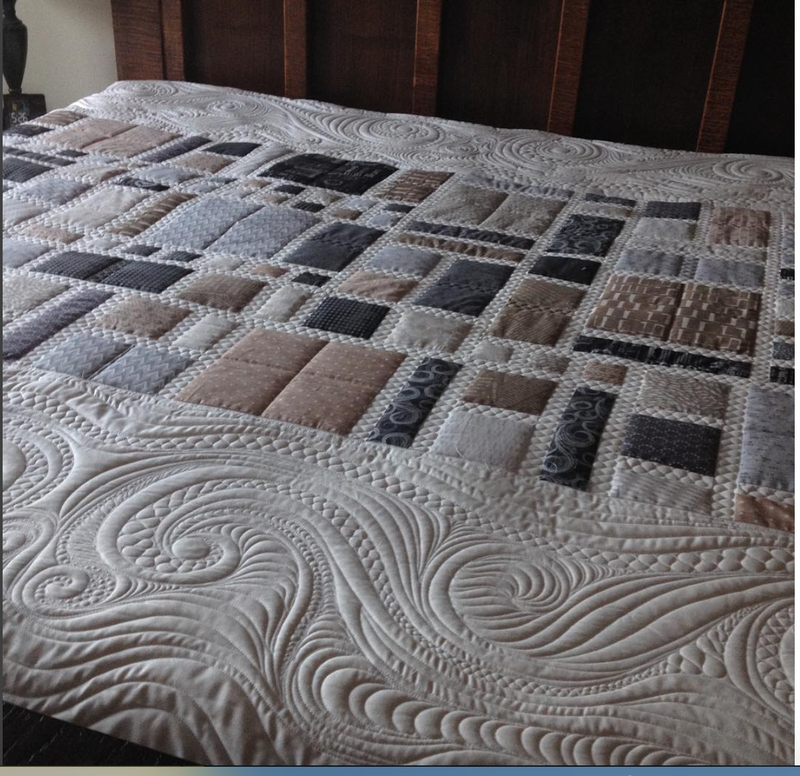 Love, love, love, this quilt. 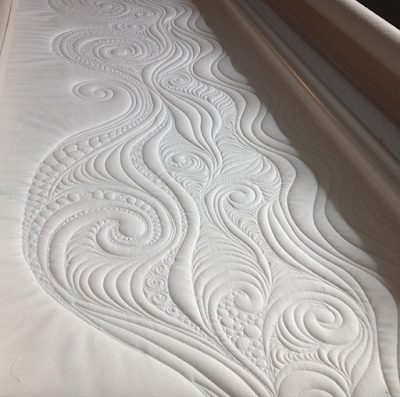 I usually don't like unquilted areas in a quilt but this works so well. You are incredibly talented. I'm just beginning the free motion quilting journey. So much to look forward to. Great job!! !